Music Minus One proudly presents the best literature from the 18th century arranged for flute and full orchestra. Solo parts are performed by European flute virtuoso Katarzyna Bury, and the Stuttgart Symphony Orchestra - conducted by Emil Kahn - provides wonderful accompaniments for these play-along pieces that will challenge and delight! 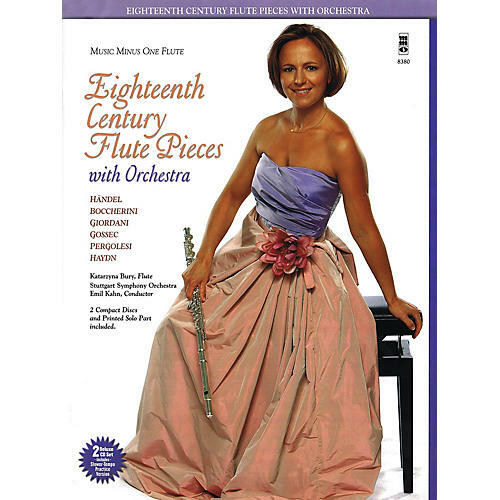 The book contains the solo flute parts, and the two CDs feature complete performances, versions without the soloist, and additional recorded accompaniments at a slower, practice tempo. Includes compositions by Boccherini, Giordani, Gossec, Handel, Haydn and Pergolesi.